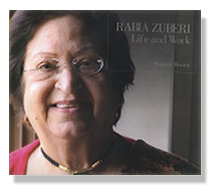 Rabia Zuberi, Pakistan's premiere women sculptor and the recipient of numerous national awards, has dedicated her life to art and art education in Pakistan. Principal of the Karachi School Of Art established over forty years ago, Rabia received her art education from the Lucknow College of Art, and after graduation in 1963, made her home in Karachi. Finding no art school in the city, Rabia with her sister Hajra and aided by Mansur Rahi opened the Karachi School of Art, flourishing today. Rabia was awarded top honours for sculpture from national Youth Art Exhibitions, held in Calcutta and New Delhi in '61, '62 and '63. The changes in Rabia's life found a reflection in her maturing work. In the 70's, she began to analyze the human anatomy working in a simplified form that gave reference to abstraction. The Dignity of Labour series was the outcome of the work entailed in the construction of the Karachi School of Art. In the 80's, Rabia looked at design as an element of sculpture, approaching it as a gender issue. In the 90's, the artists concern for the troubled city was expressed in the series: Quest for Peace. In Pakistan Rabia Zuberi's work has been nationally acknowledged by way of awards in '86, '87, and '88, and in '96 when she was awarded top honours from the 7th National Art Exhibition. In 2003, she was awarded the Lifetime Achievement Award by the Pakistan National Council of the Arts. A monumental sculpture 'Plea for Universal Peace', is in the collection of the National Art Gallery, Islamabad. Marjorie Hussain is a well-known art critic who has been engaged for over two decades in promoting Pakistans art and culture both in the country and abroad. She has curated and organized art exhibitions both at home and in foreign countries, written a history of art in the subcontinent for the Pacific Asia Museum, Pasadena, USA, traced the history of art in Pakistan for a book on Karachi: Megacity of Our Times (OUP), compiled and edited a book on Basher Mirza, and written a book for Oxford University Press: Aspects of Art. Marjorie is a regular contributor to The Gallery, a Dawn Newspaper art supplement, and writes a monthly column for She magazine. The recurring keynote is Rabia Zuberi's art work is poignant humanism. Through the medium of drawing, painting and sculpture, Rabia Zuberi has moved away from traditional female introspection into the vast arena of the world, embellished with technology but threatened with the ugly specter of violence. Rabia Zuberi has risen above the confines of her own cultural habitat and joined the chorus of universal voices in the world, hearkening mankind to turn to love, forgiveness, social justice and peace. Rabia Zuberi indeed is a phenomenon. She has single-handedly succeeded in spreading art in the society and that, too, without sacrificing our socio-cultural traditions are not followed, it is a great achievement from all aspects. Rabia Zuberi is a unique achiever in the art world of Pakistan, In an unusually quiet and dignified way, Muslim and eastern to the core, she has been practicing sculpture as an artist an promoting art as an art teacher whose Karachi School of Art has now become an institution in its own right.